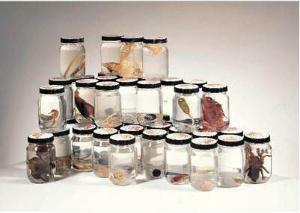 These Animal Kingdom sets include individually-labeled and jarred specimens further demonstrating the superphylum Ecdysozoa which is comprised of both Nematodes and Arthropods, plus other specimens for general study including Arthropods, Cnidarians, Echinoderms, Chordates and others. 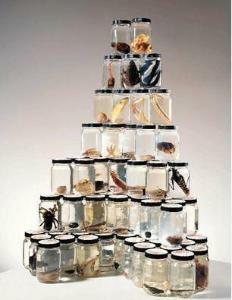 The Ecdysozoans 2 Animal Kingdom Set 2 contains the following 12 specimens: Mole Crab, Shrimp, Scud, Goose Barnacle, Honeybee Worker, Painted Lady Butterfly, Diving Beetle, Termite Worker, Dragonfly Adult, Mayfly Adult, Horseshoe Crab, and Black Widow. The General Specimens 2 Animal Kingdom Set contains the following 12 specimens: Crayfish, Painted Lady Pupa, Dermacentor, Squid, Lampshell, Moniezia, Chick, Turtle, Sea Squirt, Obelia Colony, Aequorea Victoria, and Leucosolenia. The Ecdysozoans and General Specimens 2 Animal Kingdom Set combines all 24 specimens listed in both sets above, providing cost-savings and allowing students to investigate the differences between specimens within the animal kingdom.